I've been writing and blogging on the Lexington, NC Barbecue festival for a long time now (like years). It is definately a festival to put on your list. I'm not connected in any way. I just live about 45 minutes away and usually go to celebrate my birthday. I try to pass the word and also have a blast taking pictures of this big barbecue celebration. Over the years I have tried to get in contact with the festival folks. It would be nice to know when the new information comes out about The Barbecue Festival. I know they have a press party and releases and such. I just have to keep an eye out and get the information on my own. Then, I go and take pictures and tell everyone about the festival. I've emailed through the festival home page and never had a reponse. I've tried to call the phone number listed. No answer and no answering machine. I suppose I could send a letter to the snail mail address on site, but given that they've never responded to emails and I can't get them on the phone listed, I really don't feel like doing that - taking the time and using a stamp. This year someone did send me a press release after I'd already blogged and done an article (not noticed I suppose). She asked if she could post the release on my blog - or perhaps I might even want to do that myself. Well, the only way it could go up is if I do it. Random people can not come along and just post to any old blog they want. The blogger has to do that or set up a sign in for a contributor. I did email and explain that I've been telling folks about the festival for a long time on my own and that I'd been asking to get on the press release list. I did get a response to that one that the writer just wrote and didn't know about any lists. I did post the press release on one of my blogs as well as having written my own materials about the Lexington NC Barbecue Festival. I sent the links on the festival including the full press release link I was asked to post. I did put it on Cooking Help Web. Well, that's the last I heard on that. Most people do appreciate some free publicity and a thumbs up on their events. I guess that Lexington gets enough publicity and that they don't need commoners spreading the word. It does seem that since several of my online posts on The Barbecue Festival ding the top of Google for the event (across several sites) that they might want to make sure I have information to share. It might also be a good idea to say "thanks" when sending a press release and asking someone to take time to put it up and with nothing to gain for that person. Silence is pretty deafening. I usually get a response (even from big companies) if I ask for info to share with others. When someone contacts me (as in this time), and I do take the time to write (and share the links back), then I usually get some sort of indication that it was appreciated. It's sure not like I have to write about anything online. I have a job. This is not it, or I would live in a cardboard box. In the South, we usually go the extra mile to be helpful and to note those who help out. You'll see that hospitality if you go to the Lexington, NC Festival. Lots of great people and working really hard. That's why I always try to make sure I cover them. 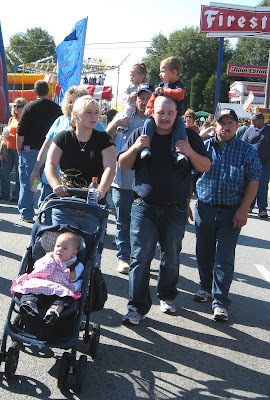 The Lexington, NC Barbecue Festival is usually my birthday trip and treat. This year, I must confess . . . I'm not so sure. If they can't respond to emails and can't answer the phone and if they send me a press release and flat out ask me to post it but don't bother to thank me for doing so, then maybe I can find something else to do for my birthday. That is really depressing. Apparently these people are not aware of the power of bloggers, especially food bloggers! Enjoy your birthday either way! It really is a great festival. I've never minded writing about it and telling others. I've enjoyed doing that. I didn't let it bother me when they didn't respond to emails (a couple) and a phone call - just asking if I could get info as it was sent out. When they contacted me though and wanted me to post their press release but can't even say "thanks" or "even got your email and links," I think that's rude. The festival is real friendly (and very Southern). I'm still surprised that they don't answer back when contacted. I'm a Winston-Salem native now living in Florida, and boy do I miss Lexington barbecue. Thanks for the post. You're gonna have to come on back home (-: Can't beat that Lexington BBQ. If I don't make the festival, I'll do a road trip and hit one of the restaurants soon.